Read about the pesticide industry’s opposition to bans on toxic chemicals on playgrounds and school athletic fields here. 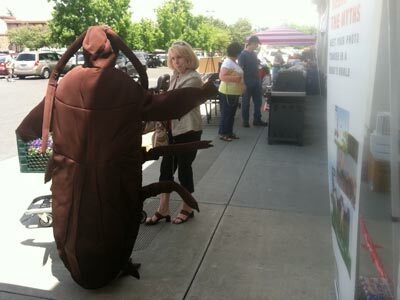 Last weekend, I had the pleasure of attending a pesticide road show. Yup, you heard me right: It’s a traveling circus of sorts, but instead of sword swallowers and tightrope walkers, the stars of this show are pest-management products. 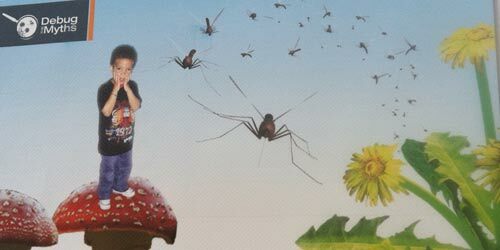 Called Debug the Myths, the tour is sponsored by the lobby group Responsible Industry for a Sound Environment (RISE), which aims to teach people to stop worrying and learn to love pesticides. A very friendly giant tick! Here, you can see her chatting up an OSH customer. 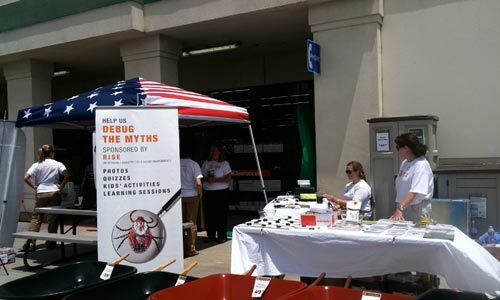 The tick directed me toward the rest of the display, where I met some other Debug the Myths staffers, including two entomologists from UC-Berkeley’s Environmental Science Policy and Management program, a representative from Target, and a spokeswoman for RISE. The new Debug the Myths Prius. “We thought it would be a better choice since gas prices are so high,” she said. How green! Know thy enemy.At another table, I perused pest dossiers, each bearing the mug of a different dastardly critter (right). Attending the tables was Karen Reardon (below), spokeswoman for RISE. We chatted for a while about the tour, which had already made a few stops in New York and Florida, and was headed to Sacramento later that week. 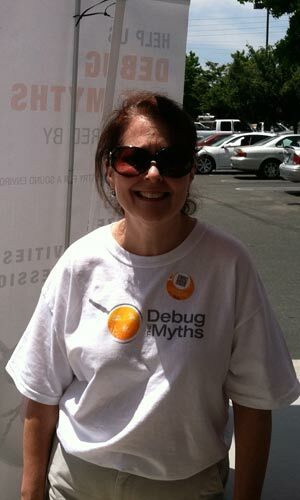 I asked Karen which specific myths she was trying to debug. 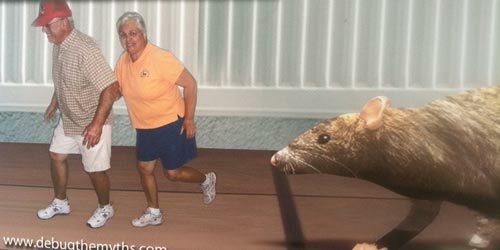 Actually, it’s funny: That picture expresses exactly, but exactly my sentiments during gym class softball games in high school. Speaking of which, I had read that one of the stops on the tour would be a minor league baseball game, where, according to the Debug the Myths website, the staff would teach kids and parents about “maintaining outdoor spaces to provide ideal playing surfaces for athletes of all ages.” Not surprising, since RISE has vociferously opposed pesticide bans on school grounds and athletic fields. Am I the only one who doesn’t find this comparison particularly reassuring? 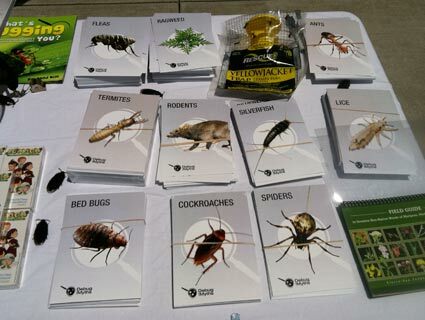 I finished up the tour by taking the “What Pest Are You?” quiz. (You can take it, too!) The result? 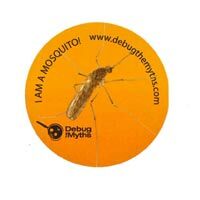 I’m a mosquito. I was awarded a sticker (above) saying as much. I’m sure the Debug staffers agreed.